Typical enterprise storage buyers are accustomed to a somewhat-appliance like experience, but with software-defined storage, customers can use the hardware they want, including SSDS. NVM Express (NVMe) has begun to gather steam in the market, with many vendors releasing NVMe SSDs over the past year or so, while the supporting ecosystem has matured. In the meantime, Samsung Electronics Co., Ltd. and Red Hat are collaborating to give the emerging technology an extra push. 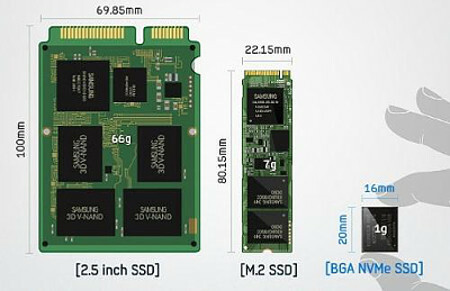 At the recent Red Hat Summit, Samsung announced its NVMe (SSD) Reference Design platform, which can be used with Red Hat Ceph Storage, a software-defined storage platform. Red Hat Ceph/Samsung Reference Architecture is essentially a recipe to build unified storage for enterprise IT or cloud environments that handle transactional databases, machine-generated data and unstructured data. The reference architecture can be used as is or customised for a specific data centre environment, and it's first reference architecture Samsung has announced for SSDs, said Bob Napaa, senior director of product and strategic planning at Samsung Device Solutions Americas. In a telephone interview with EE Times, he said the company is seeing strong demand for NVMe SSDs as a means to support cloud and high performance workloads. In the past, the company hasn't done reference designs, nor is it looking to sell enterprise storage systems, but it sees collaborating with Red Hat as a way to make it easier to adopt the relatively new NVMe technology. The reference design is also open source, and can be deployed in an OpenStack environment to support the bandwidth, latency and IOPS requirements of high performance workloads and use cases, such as distributed MySQL databases. The Samsung NVMe Reference system is engineered to provide a well-balanced storage server node that includes matching CPUs, networking and storage-PCIe connectivity to deploy large amounts of NVMe SSDs while taking advantage of the performance of Ceph as much as possible. Tests conducted by Samsung have found the Red Hat Ceph/Samsung Reference Architecture can deliver 690K IOPS and 30GB/s in a three-node cluster to meet the needs of IO-intensive and high-performance workloads. The Samsung NVMe Reference system outlines a high performance all-flash NVMe scale-out storage server with up to 24in x 2.5in hot-pluggable, PCIe Gen3 NVMe SSDs. Napaa said working with partners such as Red Hat and developing reference architectures will enable Samsung to provide proof points for its NVMe SSDs in high performance systems. Ross Turk, director of product marketing in the storage and big data business unit at Red Hat, told EE Times in a telephone interview that NVMe is proving to be ideal for software-defined storage. “Anytime you look at a distributed system you are going to pay a performance penalty." Typical enterprise storage buyers are accustomed to a somewhat-appliance like experience, he said, but with software-defined storage, customers can use the hardware they want, including SSDS, he said, and the reference guides enable them get better and predictable results. “They're sort of like cookbooks." Ceph and software-defined storage has been mainly about capacity, said Turk. “Cheap and deep" archive storage is very strong today. But if software-defined storage is to support high performance requirements, NVMe SSDs become very important. “The next frontier for software-defined storage is performance." Ceph was designed for spinning media, but moving to SSDs enables software-defined storage to be optimised for both capacity and performance, and NVMe is critical for the latter when reads and writes are distributed, he said. “You can have your cake and eat it too." Samsung is not the only company Red Hat has worked with to optimise Ceph. It has collaborated with SanDisk on its InfiniFlash technology, which uses flash, but not SSDs. It has also worked with Intel. In general, said Turk, some of the most active contributors to Ceph have been hardware makers. “We see a broad ecosystem of hardware storage vendors working on this technology."